From the vermilion dot embellishing the forehead of the indian women, to the saffron yellow garb worn by the sages and holy men seen around the country to the multi-coloured turbans worn by the Sikhs of India Colour in India, is life itself !!!. Saturday. Upon arrival at Delhi you will be met and transferred to your hotel. The following morning, attend our welcome meeting before we set out on a full day sightseeing tour of Delhi. In the evening, we enjoy a namaste dinner at an Indian restaurant. Delhi - Jaipur. Today we drive to the Pink City of Jaipur - the vibrant capital of the state of Rajasthan. Sightseeing includes a tour of the City Palace which is a wonderful example of Rajput architecture and Jantar Mantar - the world’s largest stone astronomical observatory. On day 4 early-risers can opt for a morning hot air balloon ride over Jaipur, and sail over hilltop forts, regal palaces, sleepy villages and stone carved temples. Today we travel beyond Jaipur to the beautiful 16th century Amber Fort. In true Indian style we take an elephant ride up to the entrance of the fort and tour the well-preserved interior and grounds. Then we stop at a cotton weaving house to see a demonstration of fabric dying and block printing before returning to Jaipur. Evening at leisure. 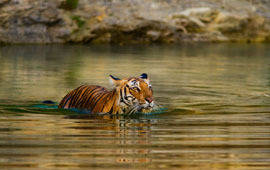 Bharatpur - Agra. En route to Agra, we visit Fatehpur Sikri, former imperial capital of the great Mughal emperor Akbar. Built between 1569 and 1585, it has been deserted for more than four centuries, by all accounts abandoned in 1600 due to a meagre supply of water. In Agra, we visit the impressive Agra Fort before touring the legendary Taj Mahal and witnessing a glorious golden sunset. Built by Emperor Shah Jahan in loving memory of his beloved wife Mumtaz, who tragically died in childbirth in 1631, the Taj Mahal in Agra is described as the most extravagant monument ever built for love and remains one of India’s most enduring symbols. Delhi - Kochi. We catch an early morning flight to Kochi today, in the beautiful southern state of Kerala. Long famed in the history books, Kochi (formerly known as Cochin) offered refuge to Jews more than 2,500 years ago. The Portuguese founded the first European colony in Kochi in the 16th century, then the Dutch quickly followed and eventually, the British. The cosmopolitan mix of cultures makes the city truly fascinating. This evening we watch a Kathakali performance. Kathakali is the fascinating traditional dance form of Kerala. Kochi - Munnar. On the morning of day 9 we enjoy a guided tour of historic Fort Kochi. We see the elegant Chinese fishing nets and explore the winding streets of the old town, visiting St Francis’ Church, Parsi Synagogue (exterior only) and a Dutch palace. After our sightseeing in Kochi we drive east to Munnar - a picturesque hill station nestled on the verdant slopes of tea plantations. On day 10 we'll take a stroll through one of the many tea plantations with our guide, who will give us a brief explanation about the different varieties of tea and how they are processed. Then we'll visit a local market before heading back to our hotel. The rest of the day is free for you to spend at your own leisure. Munnar - Alleppey - Keralan backwaters. Early this morning we set off on a scenic 4 - 5 hour drive to Alleppey. 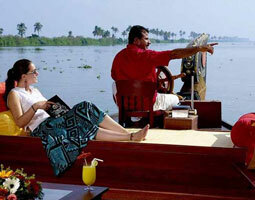 Upon arrival we board a simply furnished private rice-boat for a journey through the lush backwaters. Our rice-boat takes us sedately along the enchanting palm-fringed backwaters, covering a distance of some 20 kms, during which time the boat glides past local villages and fascinating scenes of everyday rural life. Watch a beautiful sunset over the backwaters and enjoy tasty meals (starting with lunch) prepared by the on board chef using fresh local produce. Keralan Backwaters - Kumarakom. After breakfast this morning we disembark the houseboat at Kumarakom. Perched sleepily amongst a tangle of lush tropical waterways known as the Keralan backwaters, Kumarakom is technically a cluster of islands on Lake Vembanad - one of Asia’s largest freshwater lakes. This is an ideal place to relax for the next two days and enjoy the beautiful scenery. There is also a wonderful bird sanctuary spread across 14 acres, which is a favoured haunt of migratory birds and certainly worthy of a visit.